Hello new Bake Shop friends! My name is Katie, and I blog at Good Golly Ginger. I’m happy to share my first quilt here on the Moda Bake Shop. I created the Sudoku quilt for my Aunt who is a retired math teacher and fellow quilter. Sudoku is a number game, a puzzle in the form of a grid of nine squares that are each subdivided into another grid of nine squares. The rules of the game can be found here. 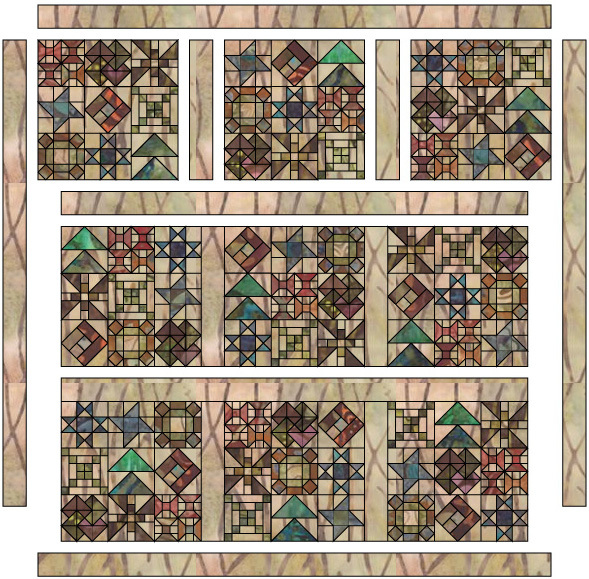 Instead of using numbers for this game of Sudoku, I chose to use traditional quilt blocks to complete my grid. 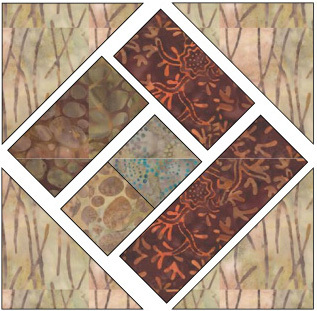 I used Edyta Sitar’s new batik line, Sticks and Stones. This fabric is such a joy to work with. 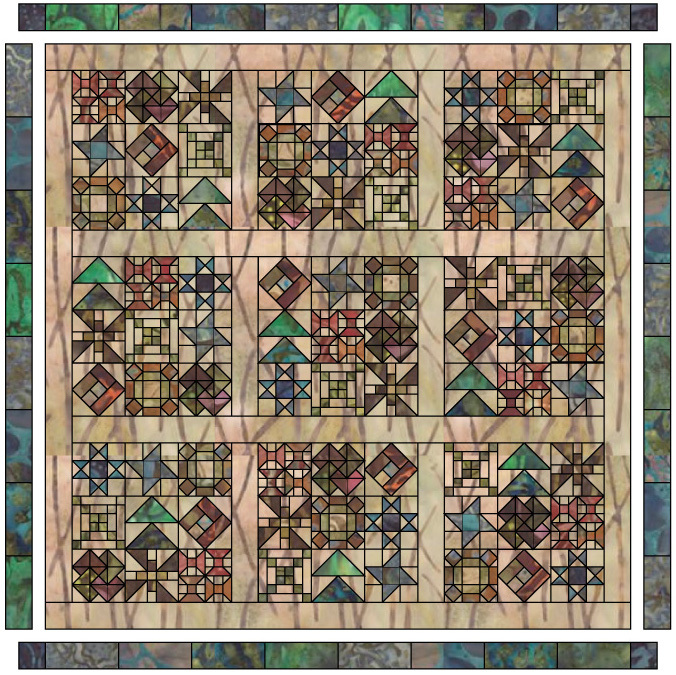 Any quilty math lover is sure to love this quilt. Use a scant quarter inch seam allowance and press seams open, unless otherwise noted. Each subdivided block is 6-1/2” unfinished. Each grid of nine blocks is 18-1/2” unfinished. Stitch one fabric a 1-1/2” x 2-1/2” rectangle to one fabric b 1-1/2” x 2-1/2” rectangle. Press. Make four units. Arrange and stitch three fabric d triangles and one fabric b triangle to the corners of one fabric a 1-7/8” square. See Diagram 2. Press and trim to 2-1/2” square. Repeat and Make 4 units. 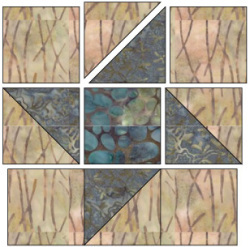 Arrange the units made in steps 1 and 2 and the remaining fabric c 2-1/2” square as shown in Diagram 2. Stitch units together and press. Repeat steps 1-3 to make nine wagon wheel blocks. Stitch one fabric a square to one fabric b square and press. Make two units. Arrange the two units made above as shown in Diagram 4. 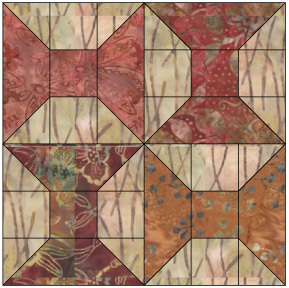 Stitch together to make one 4-patch unit and press. Stitch two fabric c 1-1/2” x 2-1/2” rectangles to the top and bottom of the 4-patch unit made above. Press. Stich one fabric a square and one fabric b square to each end of one fabric c 1-1/2” x 2-1/2” rectangle. Repeat to make 2 units. Arrange and stitch as shown in Diagram 4. Press. Stitch two fabric c 1-1/2” x 4-1/2” rectangles to each end of the unit made above. Press. Stich one fabric a square and one fabric b square to each end of one fabric c 1-1/2” x 4-1/2” rectangle. Repeat to make 2 units. Arrange and stitch as shown in Diagram 4. Press. Repeat steps 1-6 to make nine 6-Grid Chain blocks. Arrange the center of the card trick block with one 3-1/4” triangle from fabrics a, b, c, and d as shown in Diagram 6. Stitch the triangles together to make the block center and press. Trim to 2-1/2” square. 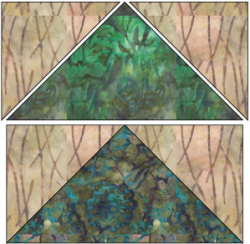 Stitch the remaining 3-1/4” triangles of fabrics a, b, c, and d to one 3-1/4” triangle of fabric e. Refer to Diagram 6 for the layout. Press. Stitch the corresponding 2-7/8” triangle to the units made above. Refer to Diagram 6 for the layout. Press. Trim each to 2-1/2” square. Make 4 HST units using the remaining 2-7/8” triangles of fabrics a, b, c, and d to the remaining 2-7/8” triangles of fabric e. Press and trim each to 2-1/2” square. Arrange the HST units and the QST unit as shown in Diagram 6. Stitch units together and press. Repeat steps 1-5 to make nine card trick blocks. Stitch one fabric a triangle to one fabric d triangle to make one HST unit. Press. Trim to 3” square. Repeat step 1 to make four HST units total. Stitch one fabric b rectangle to one fabric d rectangle. Press. Repeat step 3 to make four units. 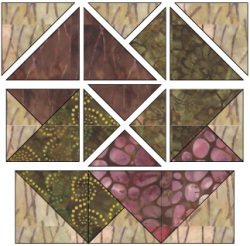 Arrange and stitch together the HSTs, rectangles, and remaining fabric c square as shown in Diagram 8. Press. Repeat steps 1-5 to make nine propeller blocks. Place (2) 1-1/2” squares of fabric e on each end of one fabric a rectangle. Draw diagonal lines on each square as shown below (dashed line, Diagram 10). Stitch on the drawn lines, and trim 1/4” from the stitched line (red line, Diagram 10). Press seams. Repeat with remaining fabric a rectangle. This makes the top and bottom of one spool. Repeat step 1 with fabrics b, c, and d.
Assemble the center of the spool by stitching (2) 1-1/2” fabric e squares to each end of the 1-1/2” fabric a square. Press. Repeat step 3 with fabrics b, c, and d.
Stitch the spool top and bottom to each matching spool center, making four spools. Arrange and stitch the spools as shown in Diagram 9 to make one complete spool block. Repeat steps 1-6 to make nine spool blocks. 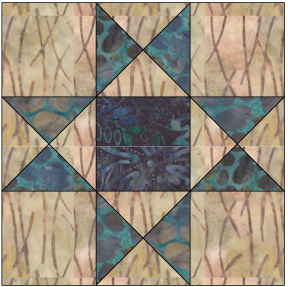 Make four HST units using triangles from fabric a and fabric c. Press and trim each HST unit to 2-1/2” square. 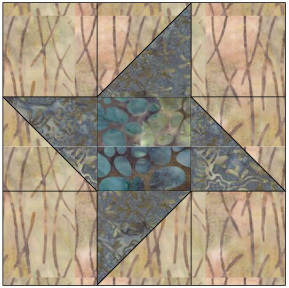 Assemble and stitch the friendship star block as shown in Diagram 12. Press. Repeat steps 1 and 2 to make nine friendship star blocks. Stitch one fabric a square to one fabric b square and press. Stitch one fabric c rectangle to the unit made above and press. 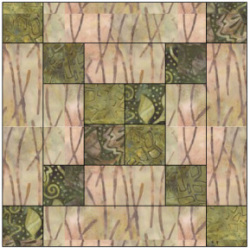 Stitch one fabric d 1-7/8” x 3-3/8” rectangle to the unit made above and press. 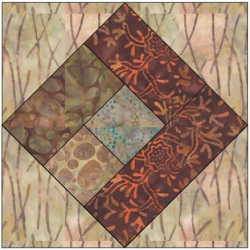 Stitch one fabric d 1-7/8” x 4-3/4” rectangle to the unit made above and press. Stitch on fabric e triangle to each of the four corners of the unit made above. Press. Trim to 6-1/2” square. Repeat steps 1-5 to make nine tilted log cabin blocks. Stitch two fabric c triangles to each side of one fabric a triangle. Press. Stitch two fabric c triangles to each side of one fabric b triangle. Press. Arrange and stitch the two flying geese units together as shown in Diagram 16. Press. Repeat steps 1-3 to make nine flying geese blocks. 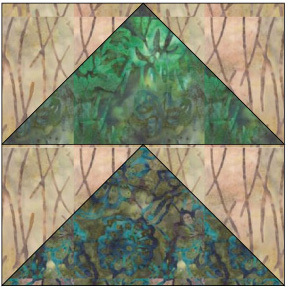 Stitch one fabric a triangle to one fabric c triangle and press. Repeat. Arrange and stitch these units together as shown in Diagram 18. Press. Repeat to make four QST units. Arrange the QST units and remaining squares as shown in Diagram 2. Stitch and press. Repeat steps 1 and 2 to make nine Ohio Star blocks. Assemble and stitch the 6-1/2” blocks together as shown in Diagram 19. The final blocks should measure 18-1/2” square. Cut and attach (2) Sticks Sand (42219 90) 2-1/2” x 18-1/2” strips of sashing between blocks of row one. Press seams toward the sashing. Repeat with each row. 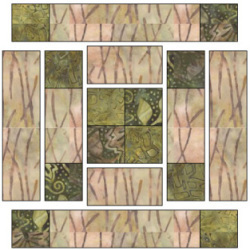 Cut and attach (2) Sticks Sand (42219 90) 2-1/2” x 58-1/2” strips of sashing between rows. Press seams toward the sashing. Stitch the rows together. Press seams toward the sashing. Cut and attach (2) Sticks Sand (42219 90) 2-1/2” x 58-1/2” strips of sashing to each end of the quilt top. Press seams toward the sashing. 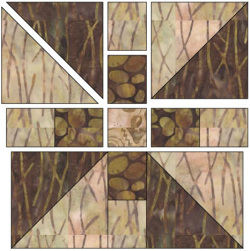 Cut and attach (2) Sticks Sand (42219 90) 2-1/2” x 62-1/2” strips of sashing to the top and bottom of the quilt top. Press seams toward the sashing. 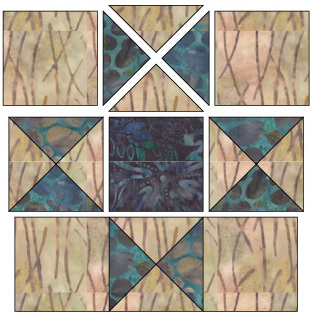 Using the 1/4-yard cuts of Iris Aqua (42219 82), Lotus River Blue (42219 78), Stones River Blue (42219 27), and Dogwood River Blue (42219 86), cut (8) 4-1/4” x 8-1/4” rectangles from each fabric. 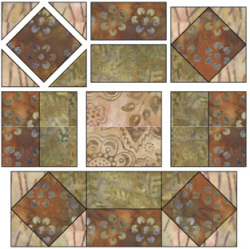 Arrange the rectangles in the following order: Iris Aqua (42219 82), Lotus River Blue (42219 78), Stones River Blue (42219 27), Dogwood River Blue (42219 86), Iris Aqua (42219 82), Lotus River Blue (42219 78), Stones River Blue (42219 27), and Dogwood River Blue (42219 86). Stitch the eight rectangles together and press open. The strip should measure 4-1/4” x 62-1/2”. Stitch (2) of the strips made in step 2 to each end of the quilt top. Press seams toward the sashing. Cut (4) 4-1/4” squares of Riverbed Navy (42219 84) and stitch one to each end of one remaining strip. Press seams toward the ends. Repeat with remaining strip. Stitch strips to the top and bottom of the quilt. Press seams toward sashing. I used 108” Stones River Blue (11100 27) for my quilt backing. Quilt as desired. I quilted mine in allover free motion feathered flowers. There was plenty fabric leftover from the backing that I used for the quilt binding. The finished quilt measures 70” square. This entry was posted in Fat Quarter Bundle, Moderate, Quilt and tagged Edyta Sitar, Errata, Fat Quarter Bundle, Good Golly Ginger, spring, Sticks and Stones, Summer. This is Gorgeous!! Wow, just to have the pattern is wonderful. You designed an amazing quilt. Thank you! It is a Beautiful quilt! It’s a great pattern – thank you! I don’t like Sudoku, my husband loves it! Guess what…..this will be his quilt…one day! Thanks for sharing this pattern with us! Uhhh LOVE it! I just love the little blocks, love the idea – it’s so fun!!! This quilt is absolutely gorgeous!! Thank you for sharing pattern-this one is definitely on my bucket list for this year. Fab! Now this is a ‘sampler’ I will embrace! And Edyta’s Sticks and Stones is a gorgeous choice. 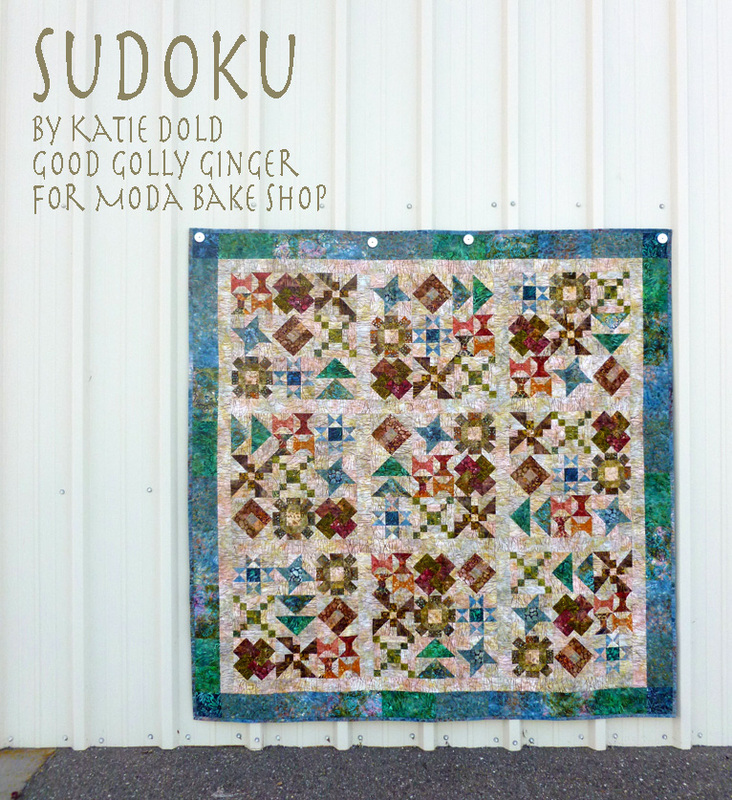 Thank you so much for sharing this quilt tutorial: don’t we all love Moda Bake Shop?! This is a very pretty quilt. Thank you!! What a great quilt! I love the colors, fabric, and the pattern. I could finally do Sudoku without erasing something (I would hope!). I am putting this one on my list to do!! Beautiful!! I forgot to mention how much I love everything Moda!! Love this quilt! 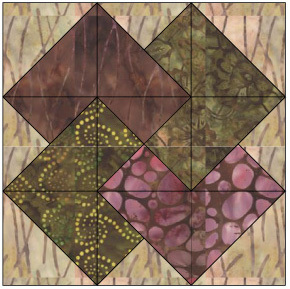 It is definitely going on my list of quilts I have to make. Several years ago I created a Sudoku Quilt using 9 different colored polka dot prints and then for a second puzzle in the same quilt I used 9 different symbols for the quilting in each block. This one I gotta make and it gave me a great idea for a quilters game for the next party!!!! this is beautiful. Thank you for sharing the picture and the pattern! Love this! Thank you for sharing with us, can hardly wait to get started! This is an awesome quilt and you are so creative. I can’t wait to find fabric and get started on one. Thanks so much for sharing. This is so inspiring. Thanks for sharing it! I want to go make my own Sudoku quilt puzzle now – I think my teenage son would love having me make something like this for him! I love this quilt and I love your directions. Very easy to understand! 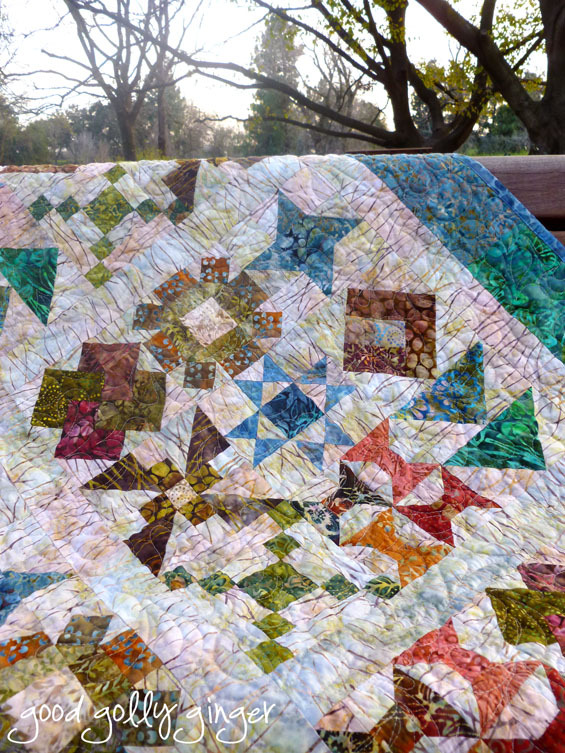 This is a well written tutorial and the quilt is quite lovely … I see it though (with the purchase of a light batik or grunge) as a scrap buster. Thank you!!! 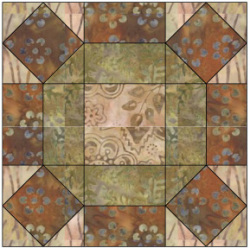 Now this is the most interesting Sudoku quilt top I have ever seen and worth doing for those Sudoku lovers and it can also be changed so everyone gets a unique quilt they can call their own – I would have to have a whole (large) family which includes me. Absolutely Beautiful….and I love how you came up with it! 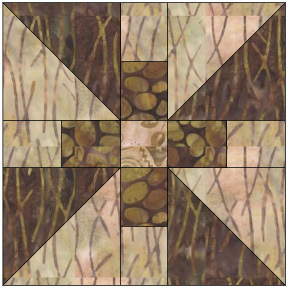 Looking for FQ bundle of the Sticks and Stones. All (8) rectangles should be cut to size 1-1/2″ x 3-1/2″ (not 1-1/2″ x 4-1/4″).